Dog agility competitions use a set number of agility tests to show how quickly your dog can perform given tasks. Training at home for competitions requires access to agility equipment. Purchasing agility equipment is expensive, leading many dog owners to seek a way to make their own equipment. 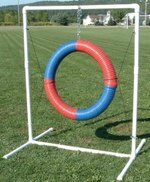 If you wish to make your own agility equipment, you need little more than some PVC piping pieces. Use a rubber mallet to hammer 12 fiberglass tent poles into the ground. Space them 20 inches apart in a straight line. Fiberglass tent poles bend when your dog presses against them. Cut 12 one-inch-diameter PVC pipes to a length of 36 inches. Wrap the outsides of the pipes in red and white electrical tape, making an alternating stripe pattern. This makes it easier for your dog to see the poles when practicing. Place the covered pipes over top of the tent poles. Hammer two one-inch-diameter PVC pipes 24 inches apart from one another into the ground using a rubber mallet. The height of the pipes should be as tall as the top of your dog's head. Attach a PVC elbow piece to the top of each pipe. Position the elbow pieces to point inwards toward one another. Apply PVC glue to the joints to hold them together. Brush the glue onto the inside of the joints using a paintbrush and then attach the PVC pieces. Insert a 24-inch-long PVC pipe into the two attached elbow pieces to complete the jump. Use PVC glue to secure it. To create a series of jumps, repeat the process with additional PVC jumps spaced 24 inches apart. To create a tire jump, tie four-foot lengths of rope around a tire or inner-tube at the 1 o'clock, 5 o'clock, 7 o'clock and 11 o'clock positions. Tie the loose ends of the ropes to the PVC frame.